Shanita Namuyimba aka Bad Black was on (Dec 6) released from jail after she paid the full amount of shs100m that was required by court before she could be allowed to seek medication for her leaky breasts. Armed with a holy bible at the court premises, Bad Black said that she will spend her first night out of prison at a church in Nsambya. “I’m not a drunkard anymore, I’ve given up partying and I'm a born again.” Bad Black said. This prompted laughter from those who were surrounded her at the time with some asking why she was clad in a micro mini skirt yet she is claiming to be saved. Bad Black told them that the lord welcomes you the way you are and this is office wear. 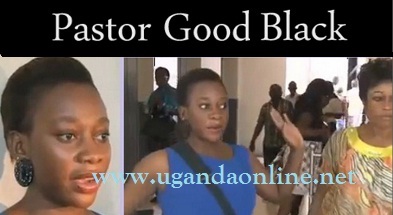 Bad Black added that she has forgiven David Greenhalgh and Meddie Ssentongo for what happened. This is not all, she has also given up on all men and will instead concentrate on taking good care of her children and preaching the word of God. Bad Black is supposed to report to court every two weeks. Her parents were in court to receive her but by the time she was done with hugging them, the dad's white shirt was lipstick stained. Shanita who was visibly happy at the time grabbed a cell phone and called one of her close buddies in Luzira prison and asked her to keep her yellow uniform and sandals safely. It’s not yet clear when she will be traveling to Dubai to have her breast implants removed.